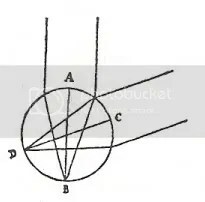 But against hyperbolic lenses, it is only objected that nothing will be able to be most clearly seen, except a visible point arising on the axis of the instrument. But this weakness [ infirmitas ] (if it would be worthwhile to call it that) is sufficiently manifested in the eye itself, though not to be impuning Nature, for whom nothing is in vain, but how much all things most appropriately she carries out [ peragit ]. Nevertheless, with conical lenses and mirrors not granted, it shall be rather with spherical portions used in place of spheriods and paraboloids in catoptrics; as with hyperboloids in dioptrics, in which portions of spheres are less appropriate. One can see how Spinoza would have sympathy to the notion that Nature does not err, but the subtle question of the “infirmitas” of human, hyperbolic vision is one that he would pause at. Insofar as human vision is used as a model for mental vision, any weakness “natural” to human beings is not redeemed by that natural state. All states a human being finds herself in are “natural”, but there is a degree of perfection which works as a fulcrum point for change and improvement in Spinoza’s thinking. The question remains whether Spinoza’s appraisal of spherical lenses as ideal is a pragmatic solution to the problem of finding the best lenses possible in the real world, or is a mistaken extension in analogy from his concept of ideal mental vision back down to the question of lens shapes, over-valuing the capacity of spherical lenses to handle otherwise would be paraxial rays. Letter 39 – …Perhaps he was silent so as not to give any preference to the circle above other figures which he introduced; for there is not doubt that in this matter the circle surpasses all other figures that can be discovered. 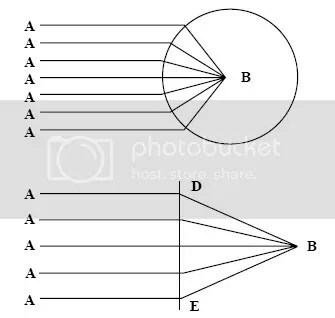 If, for example, circle ABCD should have the property that all rays coming from direction A and parallel to axis AB are refracted at its surface in such a way that they thereafter all meet at point B; and also all rays coming from point C and parallel to axis CD are refracted at its surface so that they all meet together at point D, this is something that could be affirmed of no other figure, although the hyperbola and the ellipse have infinite diameters. Letter 40 – …Moreover, it is certain that, in order to see an entire object, we need not only rays coming from a single point but also all the other rays that come from all the other points. And therefore it is also necessary that, on passing through the glass, they should come together in as many other foci. And although the eye is not so exactly constructed that all the rays coming from different points of an object come together in just so many foci at the back of the eye, yet it is certain that the figures that can bring this about are to be preferred above all others. Now since a definite segment of a circle can bring it about that all the rays coming from one point are (using the language of Mechanics) brought together at another point on its diameter, it will also bring together all the other rays which come from other points of the object, at so many other points. For from any point on an object a line can be drawn passing through the center of a circle…What I here say of the circle cannot be said of the ellipse or the hyperbola, and far less of other more complex figures, since from one single of the object only one line can be drawn passing through both the foci. This what I intended to say in my first letter regarding this matter. As said, much more than this needs to be assessed regarding these two optical letters, but in this vein we identify a prominent theme of naturalized, hyperbolic vision and its critique, stretching from Kepler, to Descartes, and alternately Gregory to Spinoza. A valuable Spinoza resource: we have an on-line photocopy edition of the 1663 work Optica Promota by James Gregory, an edition found in Spinoza’s library of books. One can see the imprint that Spinoza likely looked at. This copy is found here. Not only this, Ian Bruce has supplied us with a marvelous English translation and Latin transcript, with explanatory notes, found here in PDF parts. 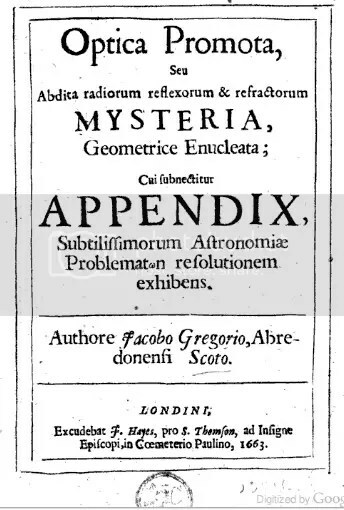 This is a signficant text, as I believe that Spinoza is arguing with Gregory’s propositions and diagrams in mind in his March 1667 letters 39 and 40 to Jelles, as he makes his objections to Descartes, and perhaps also in his June 1666 letter 36 to Hudde, showing that he had studied this volume at least by this point in time.